Stanley Black & Decker, the result of a merger between Stanley Works and Black & Decker in March 2010, hold rights to a variety of brands in the construction DIY and industrial market. In early 2006 Black and Decker acquired Vector Products, a company specialising in power inverters, jump starters and vehicle battery chargers. Shortly after the merger in 2010, Stanley Black & Decker sold the Vector Products line of battery chargers and jump starters to Baccus Global. Baccus Global LLC, formed in 2008, is a highly successful company that manufactures and sells 12 volt products suited to handle emergency situations and to make everyday travel safer and easier. The company has been partnered with the Stanley brand since before the merger in March 2010, this relationship has provided Baccus with a strong start-up period from 2008 to 2009, the merger itself provided Baccus Global LLC with the unique opportunity to acquire a greater share of the market without having to only grow naturally over time. Baccus Global use the Stanley name and logo on their products under license, the decision to do so was considered crucial as “The Stanley brand resonates deeply with both pro and high-end do-it-yourselfers”. In addition to the Stanley brand being the face of the Baccus Global jump starter range, they also work closely with Stanley Black & Decker to ensure that their products maintain the highest level of consistent quality and reliability that is represented by the Stanley brand name. Baccus produce three ranges of jump starters, from 300 Amp to 500 Amp, working with most 4, 6 and V8 engines. They have three entry level consumer jump starters that are recommended for small engines up to V6 engines. Their middle ground jump starters consist of 4 jump starters capable of jump starting larger V8 engines. The most popular jump starter, the J5C09 is in this group and is shown below. 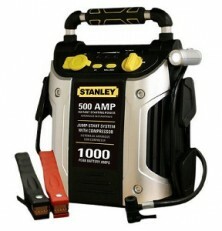 Read our Stanley J5C09 review, (their No.1 Best Selling Jump Starter), or check current deals here. Finally their performance professional range has three jump starters with built in inverters that all work up to large v8 engines.